In the unending cycle of months, as February turns to March (after an extra day this year) and Winter gives way slowly to Spring and our activity level once again increases, it is a good time to focus on one of the most important aspects of our well-being - proper nutrition. After all, as so many similar sayings go - You are what you eat. To provide a means to focus attention on the importance of making informed food choices and developing sound eating and physical activity habits, the Academy of Nutrition and Dietetics promotes March as national Nutrition Month. The aspect of nutrition and eating well can be a daunting task. Experts continuously debate over what is good for us. One day all fats are bad, the next day some are not only good, but important to our health. The same has happened to carbs and meats. And remember that old food pyramid and what it became? The latest iteration is no longer a pyramid even, but a plate (which makes more sense to me anyway - we don't eat pyramids). The National Nutrition Month® 2013 theme, "Eat Right, Your Way, Every Day," encourages personalized healthy eating styles* and recognizes that food preferences, lifestyle, cultural and ethnic traditions and health concerns all impact individual food choices. Then there is the other meaning of eating 'well' - eating good tasting food. Diets - whether for nutrition and well-being or weight management - can often seem to be bland, boring, menus of foods we don't want to eat and none of what we want. This can often be the hardest challenge of wellness - how to find food that satisfies not only your body but your taste as well - or vice versa. If we go to another saying - and add in a little common sense - I think we can all agree that nutrition is actually fairly easy - 'Garbage In, Garbage Out.' Oh yeah, and 'Everything in moderation.' I could go on forever here about the quality of the food you eat but there are plenty of resources (some right here at Well-Met Man) of what good food is and how so much of what we eat today is literally garbage. But I think we can all agree that 'more' is better than 'less'. They say variety is the spice of life (wow a lot of clichés in this one), and with nutrition I say that is a good place to start. The more different types of foods we eat, the less of any one thing we will eat and the more beneficial needs we are likely to fulfill. The plate diagram itself (on the right) shows the variety of foods we should eat, but besides varieties of food types such as vegethat there are varieties within each. The benefits of eating as many colors of food as you can is a well-known science since each color seems to contain and support different vitamins and minerals. One thing to check out here is that the same vegetable or fruit can be different colors. We all know there are different colored bell peppers and apples, but there are also red, yellow and purple carrots; even orange, green and purple cauliflower. So even if you don't like most foods of one color, you can likely find one you do like in different colors to help support the color wheel of food and you can't use that excuse. It is so often pointed out by those that switch to better food that they didn't know what they were missing. The junk food they ate seemed to taste so good but after a short adjustment period they realize that there was more of an emotional than truly taste attraction to those foods and that fresh, from scratch food is so much better to you and for you. 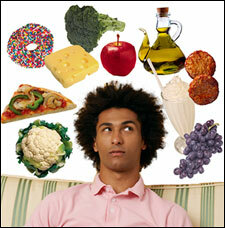 This March at least humor yourself (not me) and look into changes you can make to your eating habits. They will likely be easier and better than you ever expected.